Istanbul is a beautiful city, with something for everyone. Its food is to die for. It's rich in history, religion, nature and adventure – it's a wonderful amalgamation of all these and more. Tour operators offer packages to suit different budgets. Get in touch with one today. If you're looking for an exotic overseas holiday destination, Turkey makes for a good choice. It's a beautiful country, with the right blend of history and natural wonders; making it a wonderful place to explore. To top it, the food's earthy and a gastronomical delight and for those wanting to bring home extraordinary souvenirs, Turkey will spoil you for choice. If you look at Turkish history, the nation has always been in the thick of things. It's the only country straddling the continents of Asia and Europe; so that makes it unique. Back in the day it was the throne of the mighty Byzantine Empire. So, it's got a rich historical heritage, going back to thousands of centuries. The best way to explore Istanbul, if you are on your own, is to Google places of interest and how to get there. You can also buy tour packages online (they are cheap and convenient). If you have booked your holiday through a tour operator (we did), you'll find the itinerary planned for you, before your arrival. Turkey is famous for some of the world's most iconic sites and a visit to the country would be complete without seeing them. 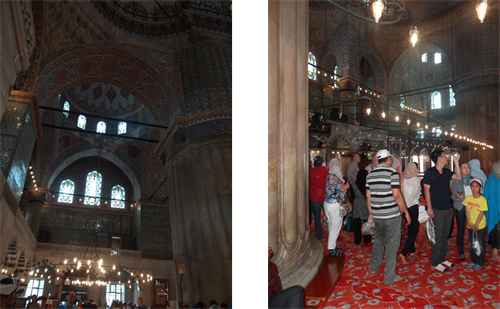 Our tour began at Istanbul; it's your regular touristy place, milling with people, locals and tourists alike. It set the mood for our Turkish exploits. Istanbul is laidback, with an old world charm, that is quite appealing. Don't be in a rush to view the sites; Istanbul is best enjoyed at leisure. I recommend you block at least 2-3 days for sightseeing. 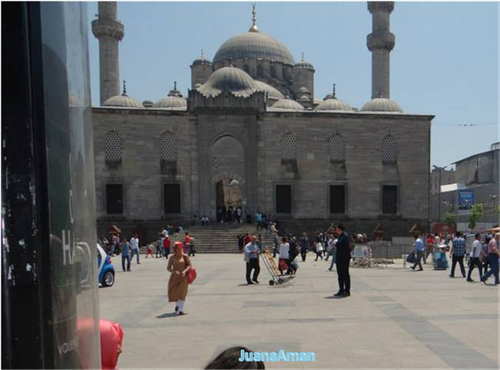 The mosque also referred to as the Blue Mosque is so called because of its blue tiled interiors. Over 20,000 pieces of ornate blue tiles adorn the interior walls. The mosque dates back to the early 17th century and was built between 1609 &1616. Its magnificent edifice made me wonder, how such architecture was possible back then. 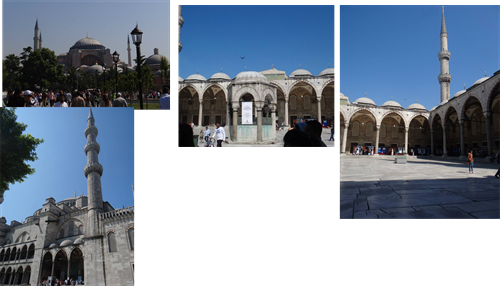 It stands tall and beautiful, with 6 imposing minarets and is apparently the only mosque in Turkey with 6 minarets. Light streams in through stained glass windows (over 250) that cover all the walls. Look out for ostrich eggs hanging with the chandeliers; they're there to keep spiders from building webs. It's an active mosque, and Muslims offer prayers here every day. It is advisable to time your visit so it does not clash with the prayer hours. There are other places to view within the grounds, like the fountains, tombs, Turkish baths etc. A special dress code is required for entering the mosque. Women need to have their heads covered and men need to have their legs covered. People throng to see the mosque at sundown, when the lights are turned on. The square around the mosque is a hub of activity. You can shop for all sorts of wares as vendors display goods on the pavement. The palace is another imposing building, with its impressive turrets drawing thousands of tourists each day. The palace was the abode of the erstwhile Ottoman sultans, its luxurious interiors are well preserved and a must see. Be prepared for long queues though, but it's worth the wait – the opulence of the 15th century structure is spellbinding. Take a walk through the palace and stroll in the palace grounds along the sea front, of the Bosphorus Sea. 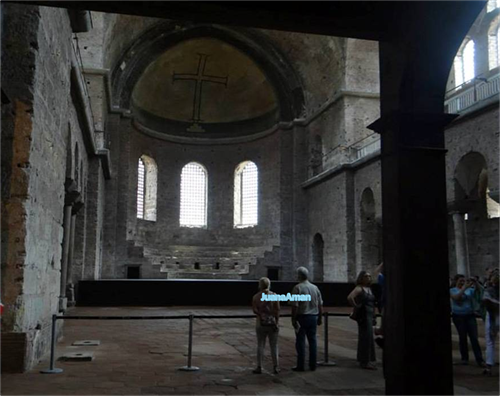 Within the precincts of the palace grounds stands the Hagia Irene, known to have been first built in the 4th century. Once a Church the building now serves as a museum and a concert hall, because of its remarkable acoustics. 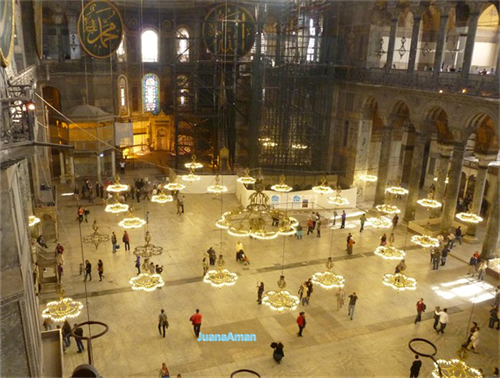 The other attractions in Istanbul include the Hagia Sophia, also known as the Aya Sofiya. The construction dates back to 537. It served as a Christian Cathedral for several centuries, before being converted into a mosque. It remained a Muslim place of worship until the early 20th century, before it was turned into a museum, the way it is seen today. It is a striking building representing the influence of two cultures; the Christian and the Muslim, which is beautifully depicted in the mosaic walls and the architecture. There are some lovely murals on the high ceilings depicting scenes from the Bible and of Our Lady and the saints, interspersed with verses written in Arabic. Another amazing feature is the multitude of flower shaped chandeliers hanging from the high ceiling. They look amazing when you look up at them. But, when you go up to the galleries and look down, the same chandeliers appear to be floating. This part of Istanbul is always buzzing with activity. You can sit along the sidewalk, under a shaded tree and watch the world go by or browse through the wares on the roadside stalls. You're sure to get a good bargain. Yet, another beautiful structure from medieval times, the Galata Tower stands over 60 meters tall and is one of the seven wonders of Byzantine Istanbul. How tall is 60 meters? That's around 18 plus storey's high. The tower is visible from vantage points in the city. Visitors can climb the tower, to witness a panoramic 360° view of Istanbul and the Golden Horn. This is the largest mosque in Istanbul and built on one of the 7 hills in the city. The mosque was first constructed in 1557, but part of it was ravaged in a fire in 1660. It was later rebuilt. It remains one of the popular tourist destinations in Istanbul. 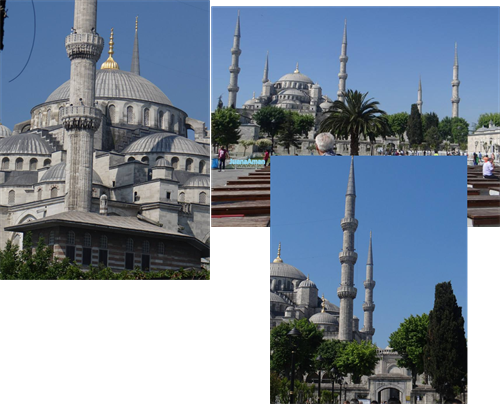 It is pretty similar to the Blue Mosque in design, but has four instead of 6 minarets. 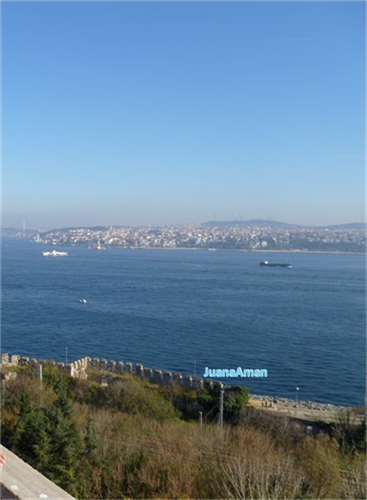 It offers a majestic view of the Golden Horn. Other places of tourist interest include the Subterranean Basilica Cistern that is a massive underground water body, held up by marble columns. 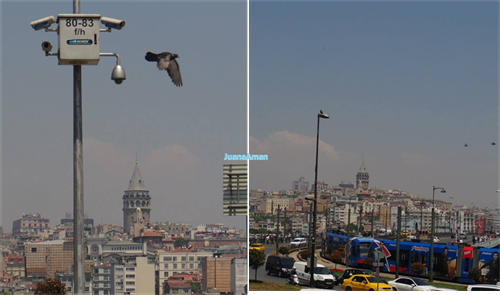 This is just a small insight of what you can see in Istanbul. There is much more that you can do in this beautiful country - take a trip to the breathtaking Pamukkale Thermal Pools or visit the Amphi theatre and the incredible Kaklik caves. Recent attacks in Istanbul airport signals an alarm for potential tourists to Turkey. However, I hope to visit Turkey when everything settles. Seems like it's a fun place to be. Can you share what expense to expect for a visit to Turkey as a tourist?